✔ 3 Concept logo designs (in a single line). ✔ 3 concept matching label designs (square shape style). ✔ One back label design to match the final chosen front label (blank with the lettering being watermarked in the background) so you can add your instructions/ingredients/warning, etc. ✔ 2 High resolution 300 dpi with CYMK color PNG's with transparent background of the final logo and label designs. ✔ PSD source file and EPS vector source of both the final chosen logo and label design (recommended for printing). ✔ 2"x2" JPEG of the Label for the candles. ✔ 4"x4" JPEG of the Label design with the address for the shipping box. ✔ Retire the designs by taking them off market and never resell them (can only use them as display samples). After placing your order we will contact you shortly to get all the information needed to get started. ✔Step 4: We will work on your design and send you the files via e-mail in 5-7 days. 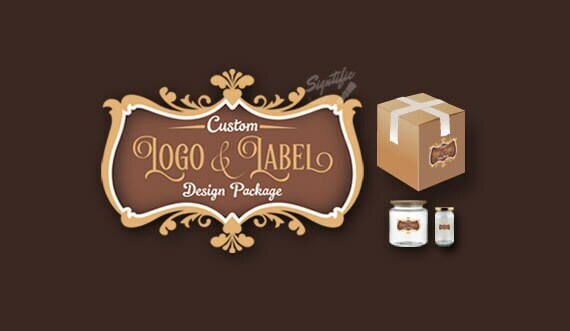 Custom logo and product label design package professional label branding design for products, candle jar label design, soap label design.